Speaking at the launch event at the Mount Saint Mary Campus in Sydney's Strathfield, ACU Vice-Chancellor Greg Craven recalled ACU’s work in the space of reconciliation. He said the RAP would help ACU solidify its commitment to involving Indigenous people in the life of the university, and to making Aboriginal and Torres Strait Islander perspectives integral to our curriculum. Jane Ceolin, the Director of First Peoples and Equity Pathways, said the RAP had been two years in the making and was an important, strategic document for ACU. 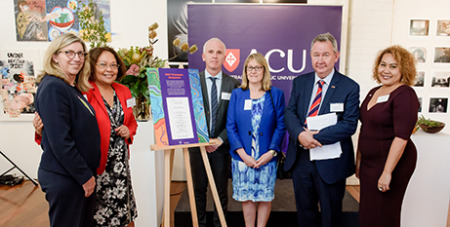 PHOTO: Professor Elizabeth Labone, left, Jane Ceolin, Professor Dermot Nestor, Professor Terri Joiner, ACU Vice-Chancellor and President Professor Greg Craven and CEO of Reconciliation Australia Karen Mundine.